River King shows a huge rainbow trout head on a gold background. The fish looks wet indeed with the surface painted with a blue reflection on top of the fish. 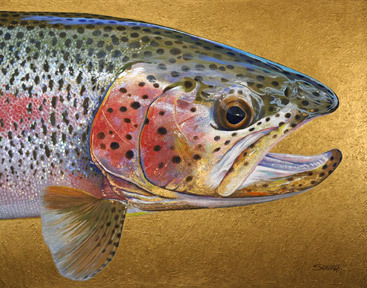 The colors of the rainbow trout include many delicate iridescent tones, which make a beautifully inviting painting. This painting is acrylic on canvas and measures 56″ wide by 44″ high with a painted gallery wrap edge. The original painting has been sold. 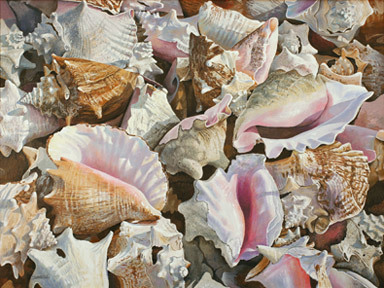 For gifts or to enjoy in your own home, giclee prints of this painting are now available. 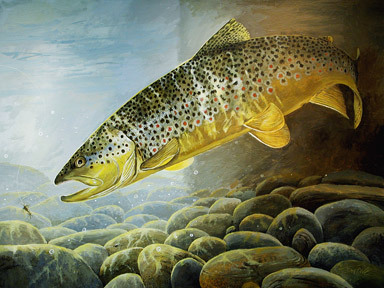 Varney Bridge Brown shows a splendid brown trout taking the stonefly nymph. He has not seen the prince nymph tied below the stonefly on the line. The bridge abutments at Varney Bridge on the Madison River in Montana are known for producing excitingly large fish. 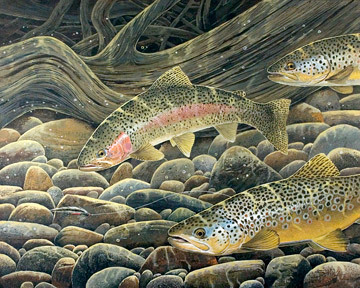 Bern has caught his share of them, which is why he can render this painting in acrylic so well. This painting measures 40″ wide by 30″ high and has been sold. Fortunately for gifts or to enjoy in your own home, giclee prints of this painting are still available. Moment of Magic shows the glorious sunset at the end of a long day fishing on the river. 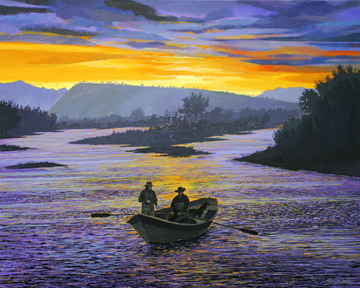 As the driftboat quietly comes to the takeout, the fishermen are happily tired but at the same time refreshed by the day. Bern knows the feeling well and has captured it perfectly in this acrylic painting on canvas. Measuring 30″ wide by 24″ high, the painting has sold and is no longer available. However, for gifts or to enjoy in your own home, giclee prints of this painting are available. 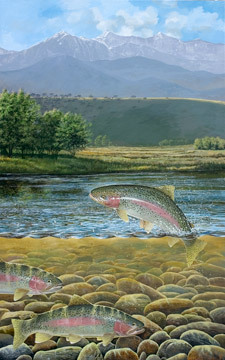 West Water is an underwater scene showing a rainbow and two brown trout competitively eyeing an alluring spruce fly cast by the hopeful angler. An old snag sits quietly in the background, peacefully ignoring the drama about to unfold. Acrylic on canvas, this painting measure 30″ wide by 24″ high and sold before it was completed. Fortunately giclee prints of this painting are also available for gifts or to enjoy in your own home. Leaping rainbows are the fisherman’s dream, surrounded by the snow capped mountains and the beautiful blue sky of an early summer day on the river. In this painting you can almost smell the willows in the air. The underwater portion completes the whole fly fishing environment, with a secret view of fish under the surface. 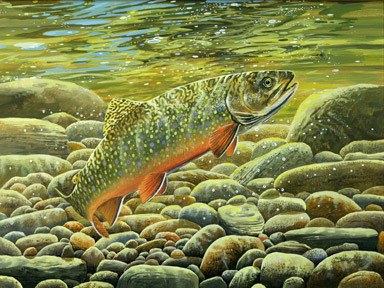 This dramatic large painting is 40″ wide by 64″ high, a special commission created to hang over a fireplace in a living room overlooking the Madison River in Montana. For gifts or to enjoy in your own home, giclee prints of this painting are also available. 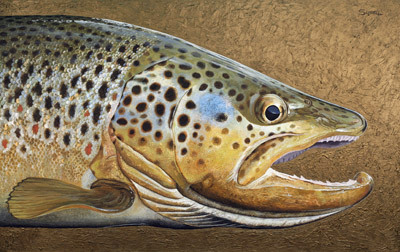 Madison Warrior has the power and strength of a great predator brown trout, a male with the characteristic hooked jaw. Bern has a great love for the brown trout, especially in the fall when they become more colorful with spawning. 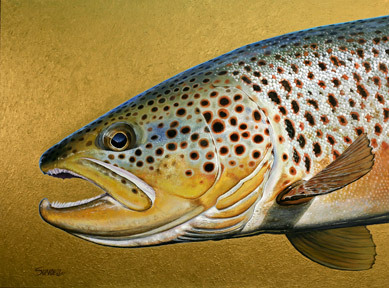 While this painting shows the formidable qualities of a big brown trout, the paint handling is an exultant celebration of the richness of color and detail brought to life on a grand scale. This painting is acrylic on canvas and measures 54″ wide by 34″ high with a painted gallery wrap edge so it can be hung without framing. The original painting has been sold. For gifts or to enjoy in your own home, giclee prints of this painting are also available.